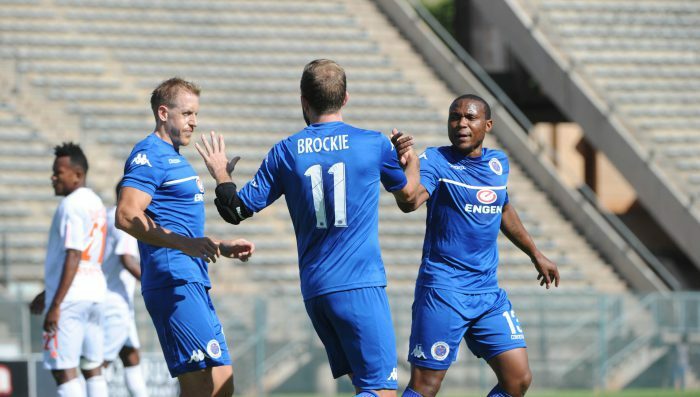 SuperSport United earned their spot in the 2017 Caf Confederation Cup after beating ASSM Elgeco Plus 2-1 at the Lucas Moripe Stadium on Sunday. Goals from Jeremy Brockie and Fagrie Lakay gave United the win and a 2-1 aggregate victory after last weekend’s first leg tie of the preliminary round encounter played in Madagascar had ended 0-0. SuperSport started the match on the front foot and after Teboho Mokoena curled a shot over the bar in the 10th minute, the home side were awarded a 13th minute penalty when Brockie was brought down by the opposition keeper. The New Zealand international converted the spot kick himself to put the Tshwane side in command. More opportunities followed for Matsatsantsa as Mokoena fired wide, Brockie kicked over the bar and Thuso Phala missed from close range. But somewhat against the run of play, the Madagascan team struck with a sensational goal on 29 minutes to level the game and potentially put themselves through on the away goal rule. However, the Tshwane men were back in the pound seat just eight minutes later when Lakay registered his first goal for the club in fine style after turning in the box and firing home. Stuart Baxter’s side came out after the break looking for a third goal and created chances. But there was no change to the score-line as Phala fired wide, Grant Kekana sent an effort straight at the Elgeco Plus keeper and Keagan Ritchie smashed a free kick over the bar. Lakay squandered another opportunity with 18 minutes to go before the visiting side had a header go wide in a rare chance for them. There were one or two anxious moments late in the game for SuperSport as the Madagascan side pressed for the equaliser which would have knocked Matsatsantsa out. But the hosts held firm in defence to book their spot in the first round proper, where they will take on Sudanese outfit Al-Ahly Shendi in the middle of next month. Their victory marked a good weekend for South African clubs in Africa after Platinum Stars also reached the Confederation Cup first round and Bidvest Wits joined reigning champions Mamelodi Sundowns (who had a bye in the preliminary round) in the CAF Champions League first round.